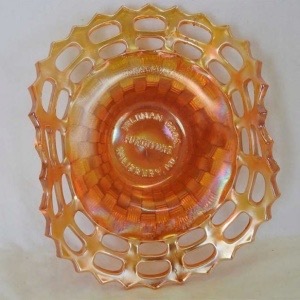 Pattern Description: Small bowls with a basketweave exterior and Feldman Bros advertising in the center. The webbing of the basketweave has two rows of open spaces at the outer edge. 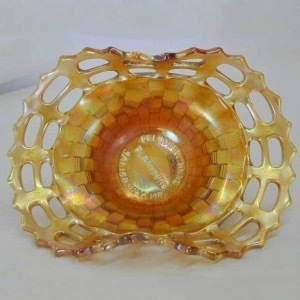 This Fenton pattern is characterized and named after the two rows of open holes that are on the top edge, the back/outside is a basketweave pattern. 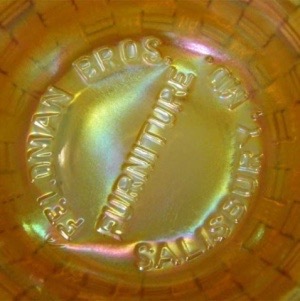 The center of the piece has molded advertising “Feldman Bros Furniture Salisbury, MD”. The collar base measures 1 7/8″. The advertising versions are 2 Sides up and marigold. The edge is sawtooth. This is one of 3 advertising versions (see oe2row-fenton-advertising). According to a newspaper article about the renovation of the building, ‘Then, in 1923, the property was transferred to Samual S. and William Feldman. They developed the Feldman’s Brothers furniture business that they began in 1906.' It is likely that they ordered these as a grand opening gift to their customers.